Can a marriage be saved even if you are doing God’s will and serving him to the best of your ability? That is the main question I took from reading The Book of Strange New Things by Michel Faber. It’s an interesting question that the novel tries to answer. I’m glad this was my choice for the first read and review of the new year. After reading this novel, I can already write that it will be one of the novels I will reflect on and think about often in 2015. The Book of Strange New Things centers around Peter Leigh, an evangelical pastor from England and his wife, Beatrice whom he calls Bea. Peter has been recruited by USIC, a NASA-like organziation, to join a space colony where his primary mission is to be a minister to the Oasans, an alien race that lives on the same colony. Beatrice is left behind in England and Peter vows to stay in contact with her throughout his entire time on the space colony. He is able read and write letters electronically with his wife and those letters are the heart of the novel. Those letters go from excitement to despair throughout the book and brought the aforementioned question at the beginning of the review to mind. I’m married and Christian and while reading The Book of Strange New Things made me think about those believers who go on missionary trips from the States to Africa or Asia or even South America and have to leave behind their spouses. Can doing God’s work create division in a marriage and even tear it apart? I will be pondering that question for the rest of 2015 and years to come. 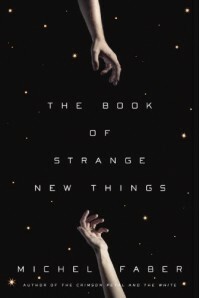 The Book of Strange New Things shows the power of fiction being able to raise the important questions without being preachy or coming to a one-size-fits all conclusion. This novel while having a science-fiction exterior actually has an interior of faith, love, and marriage. 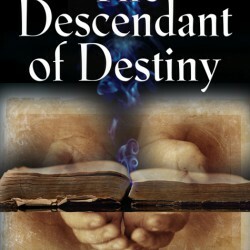 I highly recommend this thought-provoking, spiritual, and metaphysical novel and believe it should be the choice of book clubs for years to come.